Direct, lead and commission a range of strategic, county-wide and community based services, in partnership with other private and public sector agencies, ensuring the delivery and development of economic growth and county-wide infrastructure. Lead and direct the delivery of strategies to ensure efficient and cost effective provision of environment, planning and enforcement services for Kent, through a range of programmes and initiatives to support the key strategic requirements and business needs of Kent. View the job description (PDF, 337.3 KB) for the role of the Corporate Director of Growth, Environment and Transport. Barbara has worked in local government for over 20 years and has managed a range of services in the London boroughs of Kingston upon Thames, Croydon and Bromley and in Portsmouth City Council and Swale Borough Council. 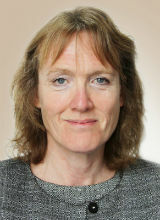 Barbara's role includes responsibility for the performance of front line services. The services include economic development, highways, waste, planning, environment, community safety, trading standards, arts and sports. Barbara has not claimed any expenses for the past financial year.